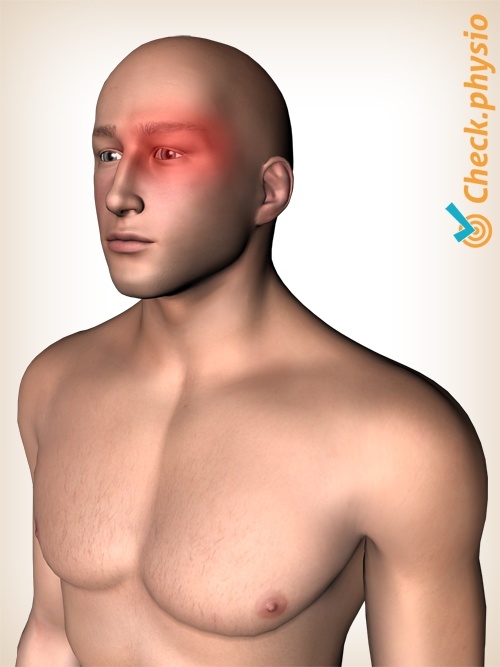 Cluster headache is an extremely painful form of headache. It is also called "Horton's neuralgia". The pain is usually located around the eye. Other forms of headache include tension headache, medication-induced headache, migraine and cervicogenic headache. The headache can be chronic or episodic. Episodic cluster headaches cause extremely severe attacks of headache over a period of two weeks to three months. These headaches can occur up to eight times per day. In the chronic form of the condition there are no pain-free periods. The attacks can occur every day. In most cases the symptoms occur episodically. It is thought that the hypothalamus and other regions of the brain play a significant role during cluster headache attacks. Not much else is known about the exact cause. Severe, sharp, stabbing pain, usually around the eye. The pain is felt on one side. An attack lasts 5 minutes to three hours. The symptoms often occur during sleep. The patient usually does not know what to do and becomes agitated. Patients can start walking around or crawling. The eye can start to tear up and a runny nose or blocked nose can occur. The treatment usually consists of administering medication. In severe cases the patient can opt for surgery or a nerve block.